Sleep, and specifically deep or slow-wave sleep [non–rapid eye movement (REM) sleep], benefits memory formation by reactivating neuronal traces that were formed during the preceding period of wakefulness. This reactivation of specific memories leads to their strengthening and transformation. Such reactivation can be experimentally induced during slow-wave sleep by presenting cues that were present during the prior period of memory acquisition. Initial studies showed that an odor present during learning of object locations enhances these memories when the participant is reexposed to the odor during slow-wave sleep after learning. These findings have been confirmed in numerous studies investigating different memory systems and also when auditory instead of olfactory cues are used. This basic research has firmly established the possibility of influencing sleep to enhance specific newly learned memories by targeted memory reactivation. The findings by Hu et al. now suggest that this method can also be used to influence implicit attitudes that are known to typically manifest themselves early during childhood and remain very stable into adulthood. Before a 90-min nap, participants underwent training aimed at countering typical implicit gender and racial biases by learning to associate genders and races with opposing attributes; that is, to associate female faces with science-related words and black faces with “good” words. Critically, presentation of the to-be-learned counterassociations was combined with a sound, which served as a cue to promote the reactivation of the newly learned associations during a subsequent nap while the participant was deep in slow-wave sleep. Only when this sound was re-presented during slow-wave sleep did the posttraining reduction in implicit social bias survive and was even evident 1 week later. These findings are all the more convincing as the authors conducted the reactivation step during a 90-min daytime nap. During normal sleep at night, the effects are expected to be even stronger, owing to the generally deeper and longer periods of slow-wave sleep and REM sleep. Additionally, the accompanying neuroendocrine milieu makes nocturnal sleep even more efficient for memory reinforcement. Previous studies have shown that such targeted reactivation of memory during sleep can effectively extinguish unwanted behavior such as experimentally induced fear in humans. The present study is the first to demonstrate that this method can be used to break long-lived, highly pervasive response habits deeply rooted in memory and thereby influence behavior at an entirely unconscious level. However, Aldous Huxley's description of a dystopian “brave new world” where young children are conditioned to certain values during sleep reminds us that this research also needs to be guided by ethical considerations. Sleep is a state in which the individual is without willful consciousness and therefore vulnerable to suggestion. Beyond that, Hu et al. 's findings highlight the breadth of possible applications to permanently modify any unwanted behavior by targeted memory reactivation during sleep. Previous research in social neuroscience has consistently shown that empathy for pain recruits brain areas that are also activated during the first-hand experience of pain. This has been interpreted as evidence that empathy relies upon neural processes similar to those underpinning the first-hand experience of emotions. However, whether such overlapping neural activations imply that equivalent neural functions are engaged by empathy and direct emotion experiences remains to be demonstrated. We induced placebo analgesia, a phenomenon specifically modulating the first-hand experience of pain, to test whether this also reduces empathy for pain. Subjective and neural measures of pain and empathy for pain were collected using self-report and event-related potentials (ERPs) while participants underwent painful electrical stimulation or witnessed that another person was undergoing such stimulation. Self-report showed decreased empathy during placebo analgesia, and this was mirrored by reduced amplitudes of the pain-related P2, an ERP component indexing neural computations related to the affective-motivational component of pain. Moreover, these effects were specific for pain, as self-report and ERP measures of control conditions unrelated to pain were not affected by placebo analgesia. Together, the present results suggest that empathy seems to rely on neural processes that are (partially) functionally equivalent to those engaged by first-hand emotion experiences. Moreover, they imply that analgesics may have the unwanted side effect of reducing empathic resonance and concern for others. The neuromodulator dopamine has a well established role in reporting appetitive prediction errors that are widely considered in terms of learning. However, across a wide variety of contexts, both phasic and tonic aspects of dopamine are likely to exert more immediate effects that have been less well characterized. Of particular interest is dopamine's influence on economic risk taking and on subjective well-being, a quantity known to be substantially affected by prediction errors resulting from the outcomes of risky choices. By boosting dopamine levels using levodopa (L-DOPA) as human subjects made economic decisions and repeatedly reported their momentary happiness, we show here an effect on both choices and happiness. Boosting dopamine levels increased the number of risky options chosen in trials involving potential gains but not trials involving potential losses. This effect could be better captured as increased Pavlovian approach in an approach–avoidance decision model than as a change in risk preferences within an established prospect theory model. Boosting dopamine also increased happiness resulting from some rewards. Our findings thus identify specific novel influences of dopamine on decision making and emotion that are distinct from its established role in learning. Brain markers of individual differences in human prosociality. Sul et al. make the fascinating observation that self-regarding and other-regarding regions of the medial prefrontal cortex show greater segregation in selfish individuals and more overlap in prosocial individuals. Despite the importance of valuing another person’s welfare for prosocial behavior, currently we have only a limited understanding of how these values are represented in the brain and, more importantly, how they give rise to individual variability in prosociality. In the present study, participants underwent functional magnetic resonance imaging while performing a prosocial learning task in which they could choose to benefit themselves and/or another person. Choice behavior indicated that participants valued the welfare of another person, although less so than they valued their own welfare. Neural data revealed a spatial gradient in activity within the medial prefrontal cortex (MPFC), such that ventral parts predominantly represented self-regarding values and dorsal parts predominantly represented other-regarding values. Importantly, compared with selfish individuals, prosocial individuals showed a more gradual transition from self-regarding to other-regarding value signals in the MPFC and stronger MPFC–striatum coupling when they made choices for another person rather than for themselves. The present study provides evidence of neural markers reflecting individual differences in human prosociality. I have read through a fascinating paper by Savage et al. that makes a convincing case for statistical universals in the structure and function of human music. I pass on the abstract and a few clips from the text. Motivated readers can request a PDF of the article from me. Music has been called “the universal language of mankind.” Although contemporary theories of music evolution often invoke various musical universals, the existence of such universals has been disputed for decades and has never been empirically demonstrated. Here we combine a music-classification scheme with statistical analyses, including phylogenetic comparative methods, to examine a well-sampled global set of 304 music recordings. Our analyses reveal no absolute universals but strong support for many statistical universals that are consistent across all nine geographic regions sampled. These universals include 18 musical features that are common individually as well as a network of 10 features that are commonly associated with one another. They span not only features related to pitch and rhythm that are often cited as putative universals but also rarely cited domains including performance style and social context. These cross-cultural structural regularities of human music may relate to roles in facilitating group coordination and cohesion, as exemplified by the universal tendency to sing, play percussion instruments, and dance to simple, repetitive music in groups. Our findings highlight the need for scientists studying music evolution to expand the range of musical cultures and musical features under consideration. The statistical universals we identified represent important candidates for future investigation. Pitch: Music tends to use discrete pitches (1) to form nonequidistant scales (2) containing seven or fewer scale degrees per octave (3). Music also tends to use descending or arched melodic contours (4) composed of small intervals (5) of less than 750 cents (i.e., a perfect fifth or smaller). Rhythm: Music tends to use an isochronous beat (6) organized according to metrical hierarchies (7) based on multiples of two or three beats (8)—especially multiples of two beats (9). This beat tends to be used to construct motivic patterns (10) based on fewer than five durational values (11). Form: Music tends to consist of short phrases (12) less than 9 s long. Instrumentation: Music tends to use both the voice (13) and (nonvocal) instruments (14), often together in the form of accompanied vocal song. Performance style: Music tends to use the chest voice (i.e., modal register) (15) to sing words (16), rather than vocables (nonlexical syllables). Social context: Music tends to be performed predominantly in groups (17) and by males (18). The bias toward male performance is true of singing, but even more so of instrumental performance. The 304 recordings from the Garland Encyclopedia of World Music show a widespread geographic distribution. They are grouped into nine regions specified a priori by the Encyclopedia’s editors, as color-coded in the legend at bottom: North America (n = 33 recordings), Central/South America (39), Europe (40), Africa (21), the Middle East (35), South Asia (34), East Asia (34), Southeast Asia (14), and Oceania (54). Passed on to me by a friend... still vaporware, but cute. A fascinating piece from Amal noting that human screams occupy a privileged niche in the communication soundscape. Screaming is arguably one of the most relevant communication signals for survival in humans. Despite their practical relevance and their theoretical significance as innate and virtually universal vocalizations, what makes screams a unique signal and how they are processed is not known. Here, we use acoustic analyses, psychophysical experiments, and neuroimaging to isolate those features that confer to screams their alarming nature, and we track their processing in the human brain. Using the modulation power spectrum, a recently developed, neurally informed characterization of sounds, we demonstrate that human screams cluster within restricted portion of the acoustic space (between ∼30 and 150 Hz modulation rates) that corresponds to a well-known perceptual attribute, roughness. In contrast to the received view that roughness is irrelevant for communication, our data reveal that the acoustic space occupied by the rough vocal regime is segregated from other signals, including speech, a pre-requisite to avoid false alarms in normal vocal communication. We show that roughness is present in natural alarm signals as well as in artificial alarms and that the presence of roughness in sounds boosts their detection in various tasks. Using fMRI, we show that acoustic roughness engages subcortical structures critical to rapidly appraise danger. Altogether, these data demonstrate that screams occupy a privileged acoustic niche that, being separated from other communication signals, ensures their biological and ultimately social efficiency. Ohmygawd - a social app that aims for fleeting authenticity? I prodded my troglodyte brain to actually read this article about yet another social networking app, Beme, and came away fascinated. More constant and fleeting interacting than I want or could handle, but a clever trick with an iPhone. You just hold the front of the phone against your chest, and the phone's proximity detector functions as a record button to film the scene you are facing. You can view the Bemes of friends you are following, as they can view yours. If you like, you can send a real time selfie to react to what your friend is doing.... after viewing is done, the exchange is erased. Talk about fleeting glances. WIRED magazine thinks that this flight from the curated self to authenticity may be judged to be too boring by many users. Urbanization has many benefits, but it also is associated with increased levels of mental illness, including depression. (More than 50% of people now live in urban areas. By 2050 this proportion will be 70%.) It has been suggested that decreased nature experience may help to explain the link between urbanization and mental illness. This suggestion is supported by a growing body of correlational and experimental evidence, which raises a further question: what mechanism(s) link decreased nature experience to the development of mental illness? One such mechanism might be the impact of nature exposure on rumination, a maladaptive pattern of self-referential thought that is associated with heightened risk for depression and other mental illnesses. 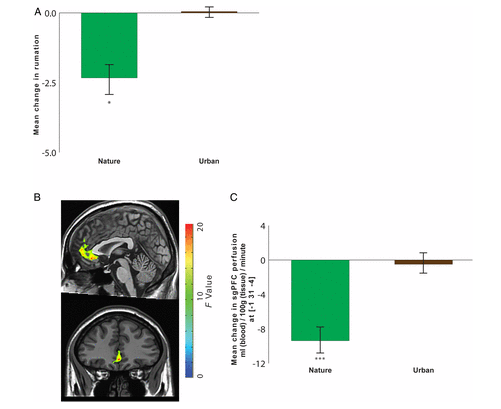 We show in healthy participants that a brief nature experience, a 90-min walk in a natural setting, decreases both self-reported rumination and neural activity in the subgenual prefrontal cortex (sgPFC), whereas a 90-min walk in an urban setting has no such effects on self-reported rumination or neural activity. In other studies, the sgPFC has been associated with a self-focused behavioral withdrawal linked to rumination in both depressed and healthy individuals. This study reveals a pathway by which nature experience may improve mental well-being and suggests that accessible natural areas within urban contexts may be a critical resource for mental health in our rapidly urbanizing world. On arrival at our laboratory, each participant completed a self-report measure of rumination (RRQ) and underwent our scanning procedure. We then randomly assigned each participant to a 90-min walk in either a natural environment (19 participants) or urban environment (19 participants). The nature walk took place near Stanford University, in a greenspace comprising grassland with scattered oak trees and shrubs. The urban walk took place on the busiest thoroughfare in nearby Palo Alto (El Camino Real), a street with three to four lanes in each direction and a steady stream of traffic (Fig. S1). After the walk, each participant returned to the laboratory and provided a second, follow-up self-report of levels of rumination (RRQ) before undergoing a second resting-state ASL scan. Transportation to and from the walk was via a car ride of 15-min duration (for both walks). Participants were given a smartphone and told to take 10 photographs during their walk (Fig. S2). These photographs were used to verify that participants went on the walk. We also tracked the phone itself during the walk, as further verification that the correct route was taken by each participant. The impact of nature experience on self-reported rumination and blood perfusion to the sgPFC. (A) Change in self-reported rumination (postwalk minus prewalk) for participants randomly assigned to take a 90-min walk either in a natural setting or in an urban setting. (B) A time-by-environment interaction in blood perfusion was evident in the sgPFC. F map of significant interactions at a threshold of P less than 0.05, FWE corrected for multiple comparisons. (C) Change in blood perfusion (postwalk minus prewalk) for participants randomly assigned to take a 90-min walk either in a natural setting or in an urban setting. Error bars represent SE within subjects: *P less than 0.05, ***P less than 0.001. ...personal thoughts and feelings are the central drivers of human action — not roles, not values, not personal sensation, not God. In the United States, the enormous psychotherapeutic and self-help industry teaches us that we must pay scrupulous attention to inner experience. To succeed and be happy, we are taught, we need to know what we feel. It’s a charming movie. It is also distinctly American. It is based on a particular model of the mind that we take for granted, but that is in fact as culturally idiosyncratic as the way we dress. I’m not suggesting that the basic science of emotion depicted in the movie is wrong. Emotions do seem to be crucial in organizing human thinking. I’m suggesting that there is something deeply cultural about the way this mind is imagined, and that it has consequences for the way we experience thoughts and feelings. Our high anxiety, whatever the challenges we face, is probably one of the consequences. When happiness is recast as an individual choice, attitude becomes everything and circumstances are made irrelevant. Martin Seligman, the founder of positive psychology, has worked hard to spread this message, referring to studies that suggest that victims of car crashes are, on the whole, neither less nor more unhappy than lottery winners. Even if we find such insights interesting or inspiring, they do not form a particularly helpful basis when we seek to make happiness the goal of politics. If we may all be equally happy, irrespective of our circumstances, then that would equip politicians like Mr. Bush with a convenient excuse to stop looking at structural issues like class, social and economic inequality or poverty. When happiness has become championed and talked about incessantly, as it is today, the best we can hope for is that it raises other universal issues — like equality, justice, truth and ethics, which we desperately need to discuss. The worst that can happen — and this is unfortunately already underway — is that happiness becomes a Trojan horse used to normalize inequality and oppression. Poor people may then be sent to happiness courses to improve their attitudes, or assigned personal life coaches, as Paul Ryan once proposed in his bizarre anti-poverty plan. Be wary. When politicians suggest that happiness be made the ultimate aim for society we should remember that they are probably not talking about happiness at all. They are talking about ideology: their own political agendas in disguise. How did kindness come to be our forbidden pleasure? …only in recent times — in large part thanks to Emerson — did the ideal of independence and self-reliance become the benchmark of spiritual success. The need for belonging has become an intolerable manifestation of vulnerability…Perhaps because open-heartedness is impossible without vulnerability — an open heart is an aperture through which the world can enter us, but also one through which exploitive and cruel forces can penetrate the softest core of who we are without obstruction — the original meaning of and longing for kindness has been calcified by our impulse for armoring and self-protection. Participants in the senior olympics have fitness age 25 years younger than their chronological age. How to better learn things. Review of Benedict's Carey's book on how to most effectively learn new things. Ways in which women are better decision makers. In tense or anxious situations, men are more likely to make risky decisions. The tendency to take more risks when under pressure is stronger in men who experience a larger spike in cortisol. In women a slight increase in cortisol seems actually to improve decision-making performance. Related to the above, Endogenous cortisol predicts decreased loss aversion in young men. Internet research project draws conservative ire. A 4-year-old academic study of how information spreads on Twitter has become the target of withering attacks from conservative bloggers and politicians. The Truthy project, by researchers at Indiana University (IU), Bloomington, is part of a growing body of work on how online memes—messages about ideas, issues, and events—can shape phenomena ranging from protest movements to outbreaks of disease. The National Science Foundation is a major funder of the project, which is one element in a broader initiative to understand complex, nonlinear feedback systems. But critics, who cite the project as an unwise use of taxpayer dollars, say Truthy is really an attempt by the U.S. government to monitor and restrict free speech. IU scientists say that is a gross distortion of what they have been doing. Purpose in life and use of preventative health care services. Less than 50% of people over the age of 65 are up-to-date with core preventive services. Identifying modifiable factors linked with preventive services are important targets for research and practice. Purpose in life, recently the focus of multiple intervention studies, has been linked with better health (mental and physical) as well as improved health behaviors. However, its association with health care use has been understudied. We found that higher purpose was linked with greater use of several preventive health care services and also fewer nights spent hospitalized. These results may facilitate the development of new strategies to increase use of preventive health care services and improve health, thereby offsetting the burden of rising health care costs in our aging society. Genetic risk factors for bipolar disorder and schizophrenia predict creativity. We tested whether polygenic risk scores for schizophrenia and bipolar disorder would predict creativity. Higher scores were associated with artistic society membership or creative profession in both Icelandic (P = 5.2 × 10−6 and 3.8 × 10−6 for schizophrenia and bipolar disorder scores, respectively) and replication cohorts (P = 0.0021 and 0.00086). This could not be accounted for by increased relatedness between creative individuals and those with psychoses, indicating that creativity and psychosis share genetic roots. They used a large discovery sample of 86,292 adults from Iceland and four replication samples totaling over 27,000 adults from Sweden and the Netherlands. All had genome-wide SNP genotyping and their professions were known. None of them knowingly suffered from a psychiatric illness. About 1% of them were artists, including actors, dancers, musicians and writers. The authors piggy-backed on recent large genome-wide association studies (GWASs) conducted on SCZ (Schizophrenia) and BD (bipolar disorder) patients and controls, and used the estimated effect on risk of SCZ and BD from thousands of SNP variants that were associated with either SCZ or BD. They then used the observed genotypes in the healthy people from Iceland, Sweden and the Netherlands and predicted a genetic risk score—the sum of associated risk alleles weighted by their estimated effect sizes. Power et al. found that people at higher genetic risk for SCZ or BD had a higher probability of being employed as an artist or belonging to an artists' union. Welcome to the post-genomic age. The idea of the human genome is obsolete…It’s fashionable now to speak of multiple genomes in a single individual, generated by mutations that occur as the body’s cells grow and divide. And genomes aren’t enough: everything has an “-ome” these days. The epigenome, proteome, microbiome, metabolome, connectome, interactome—each vies to be the next new scientific thing to set the public imagination on fire. If genes seem to lose their luster, there is no shortage of biological paradigms looking to take their place. The authors describe the epigenome—chemical modifications to DNA that affect when genes are expressed—as each person’s “second genome,” one subject to heritable change due to environmental effects. As it happens, “Second Genome” is also the name of a company that aims to develop therapeutic interventions for the microbiome, which has been increasingly linked to physical health as well as moods and mental disease. “My microbiome made me do it,” one T-shirt proclaims. It’s no surprise that scientists and the media alike embrace these totalizing languages. They have a seductive simplicity. Genomes first or second are reified into biology itself; scientific progress morphs into promises of technologically designed utopia. “Forever Young, Beautiful, and Fearless?” asks one chapter. “The Robot-Computer-Human Interface,” posits another. It is enough, I hope, to give one pause. Genetic (epigenetic, microbial) engineering could be used for disastrous ends, with or without intent. At the grand-historical scale of the authors’ imaginings, technologies alone cleave a Gordian knot, leaving convoluted personal, political, and societal consequences in their wake. We may submit to these totalizing scientific vocabularies to pursue fantasies of total biological control, but the bargain is Faustian. When scientific concepts become all that is worth knowing, humanity shrinks to fit what can be known. When all aspects of the human experience are fully and scientifically understood—when DNA becomes the language of personality, and hormones, microbes, and electric pulses the substance of emotion—when genes, memories, and thoughts can be generated and manipulated at will—then, will mankind have ascended at last? MindBlog has done a number of posts on how physical changes in our bodies can influence social cognition (Holding a warm versus an iced cup of coffee makes you more friendly). In yet another example of embodied cognition, Forest et al. note an interesting relationship between physical instability and perceived social relationship stability. What influences how people feel about and behave toward their romantic partners? Extending beyond features of the partners, relationship experiences, and social context, the current research examines whether benign, relationship-irrelevant factors—such as one’s somatic experiences—can influence relationship perceptions and interpersonal behavior. Drawing on the embodiment literature, we propose that experiencing physical instability can undermine perceptions of relationship stability. Participants who experienced physical instability by sitting at a wobbly workstation rather than a stable workstation (Study 1), standing on one foot rather than two (Study 2), or sitting on an inflatable seat cushion rather than a rigid one (Study 3) perceived their romantic relationships to be less likely to last. Results were consistent with risk-regulation theory: Perceptions of relational instability were associated with reporting lower relationship quality (Studies 1–3) and expressing less affection toward the partner (Studies 2 and 3). These findings indicate that benign physical experiences can influence perceptions of relationship stability, exerting downstream effects on consequential relationship processes. Thomas Edsall offers interesting comments on the seeming intractability of rising inequality in our society, and I pass on a few clips, continuing the MindBlog topic thread that has been contrasting the brains and behaviors of advantaged and disadvantaged segments of our society (cf. here). Why are today’s working poor so quiescent?...First, although incomes have declined, the cost of many goods – televisions, computers, air-conditioners, household appliances, cellphones – has fallen, leaving the bottom quintile less deprived than simple income figures might reflect. Second, people nowadays marry and have children later in life than in the past, postponing some financial demands to better earning years. Third, some economists contend that commonly used inflation measures result in excessively high estimates of the real-world cost of goods for consumers, thus making living conditions less dire than they might otherwise be. But there is another reason that there has not been broad public insurrection...Society has drastically changed since the high-water mark of the 1930s and 1960s when collective movements captured the public imagination. Now, there is an inexorable pressure on individuals to, in effect, fly solo. There is very little social support for class-based protest – what used to be called solidarity...Collective social action...has been supplanted by a different kind of revolt...the top priorities of the specific movements associated with individualization – “the feminist movement, lesbian-gay-bisexual-transgender movements, the black power movement, the disability rights movement, and, most recently, the fat-acceptance movement” – do not lend themselves to broad economic demands on behalf of the less well off. Edsall offers summaries worth reading, of the arguments in several recent books on the individualization of society over the past 50 years. Political ideology, self control, and belief in free will. Surprisingly little is known about the self-control consequences of individuals’ political ideologies, given the centrality of political ideology to people’s self-identity and the vitality of self-control to human functioning. This research addresses this unexplored gap by offering insight into the processes (freewill beliefs) and factors (the value of freewill for effective self-control) that lead both conservatives and liberals to demonstrate greater self-control. In doing so, these findings provide a platform by which to broaden our understanding of the underlying mechanisms impacting self-control as well as an alternative perspective for interpreting previously documented differences between conservatives and liberals (e.g., intelligence, academic success). Evidence from three studies reveals a critical difference in self-control as a function of political ideology. Specifically, greater endorsement of political conservatism (versus liberalism) was associated with greater attention regulation and task persistence. Moreover, this relationship is shown to stem from varying beliefs in freewill; specifically, the association between political ideology and self-control is mediated by differences in the extent to which belief in freewill is endorsed, is independent of task performance or motivation, and is reversed when freewill is perceived to impede (rather than enhance) self-control. Collectively, these findings offer insight into the self-control consequences of political ideology by detailing conditions under which conservatives and liberals are better suited to engage in self-control and outlining the role of freewill beliefs in determining these conditions. Detecting lies is difficult. Accuracy rates in experiments are only slightly greater than chance, even among trained professionals. Costly programs aimed at training individual lie detectors have mostly been ineffective. Here we test a different strategy: asking individuals to detect lies as a group. We find a consistent group advantage for detecting small “white” lies as well as intentional high-stakes lies. This group advantage does not come through the statistical aggregation of individual opinions (a “wisdom-of-crowds” effect), but instead through the process of group discussion. Groups were not simply maximizing the small amounts of accuracy contained among individual members but were instead creating a unique type of accuracy altogether. Groups of individuals can sometimes make more accurate judgments than the average individual could make alone. We tested whether this group advantage extends to lie detection, an exceptionally challenging judgment with accuracy rates rarely exceeding chance. In four experiments, we find that groups are consistently more accurate than individuals in distinguishing truths from lies, an effect that comes primarily from an increased ability to correctly identify when a person is lying. These experiments demonstrate that the group advantage in lie detection comes through the process of group discussion, and is not a product of aggregating individual opinions (a “wisdom-of-crowds” effect) or of altering response biases (such as reducing the “truth bias”). Interventions to improve lie detection typically focus on improving individual judgment, a costly and generally ineffective endeavor. Our findings suggest a cheap and simple synergistic approach of enabling group discussion before rendering a judgment. ...the movie’s portrayal of sadness successfully dramatizes two central insights from the science of emotion. First, emotions organize — rather than disrupt — rational thinking. Traditionally, in the history of Western thought, the prevailing view has been that emotions are enemies of rationality and disruptive of cooperative social relations...But the truth is that emotions guide our perceptions of the world, our memories of the past and even our moral judgments of right and wrong, most typically in ways that enable effective responses to the current situation...Second, emotions organize — rather than disrupt — our social lives. Studies have found, for example, that emotions structure (not just color) such disparate social interactions as attachment between parents and children, sibling conflicts, flirtations between young courters and negotiations between rivals...Other studies find that it is anger (more so than a sense of political identity) that moves social collectives to protest and remedy injustice. Research that one of us has conducted has found that expressions of embarrassment trigger others to forgive when we’ve acted in ways that momentarily violate social norms. The Higher Life - A mindfulness guru for the tech set. A brief post to point to an engaging article in The New Yorker by Lizzie Widdicombe that describes the efforts of Andy Puddicombe and others to bring meditation and mindfulness techniques to digital burnouts, expanding the definition of success beyond money and power to include well-being, wonder, wisdom, giving...etc. Anecdotes abound about the frequent use of the Internet to view cat-related media. Yet, research has yet to seriously address this popular culture phenomenon rooted largely in social media platforms. It is possible that viewing of online cat media improves mood, but this activity may also foster negative outcomes linked to using the Internet for procrastination. The present survey of Internet users (N = 6795) explored the correlates of viewing “Internet cats,” motivations for consuming this media, and its potential effects on users. It also tested a conceptual model predicting enjoyment as a function of the relationships between procrastination, guilt, and happiness. Results reveal significant relationships between viewing and personality types and demonstrate conceptual nuances related to the emotional benefits of watching Internet cats. The TAME test is for metformin, which suppresses glucose production by the liver and increases sensitivity to insulin. The drug has been used for more than 60 years and is safe and prolongs healthy life and lifespan in worms and in some mouse strains. Data also suggest that it could delay heart disease, cancer, cognitive decline and death in people with diabetes. Plans call for the trial to enrol 3,000 people aged 70–80 years at roughly 15 centres around the United States. The trial will take 5–7 years and cost US$50 million, Barzilai estimates, although it does not yet have funding.